Most of the area inside the reef is less than 20 feet deep and you can see as much with a mask and snorkel from the surface as you can diving. In just 6-10 feet of water you'll find an amazing diversity of marine life. Also the reef provides protection which makes for extremely clear, calm water so it's ideal for snorkeling. 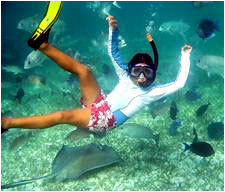 The most-popular areas for snorkeling from Ambergris Caye are Hol Chan Marine Reserve, Shark Ray Alley and Mexico Rocks. Visits to Hol Chan and Shark Ray Alley to the south of San Pedro are usually combined into one trip, while Mexico Rocks to the north of town is usually a separate trip. 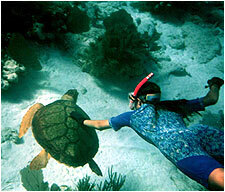 Our snorkeling trips usually last three to three and half hours. Typically, our snorkel boats go out once in the morning at 9:00 am and once in the afternoon, at 2:00 pm. 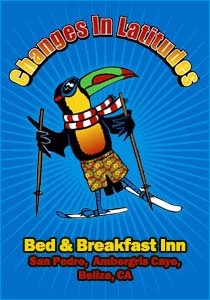 We pick you up at your hotel or other requested location. 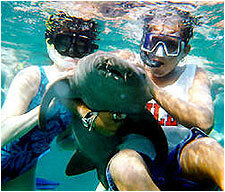 The best snorkeling trip you will ever experience will be the combination of Hol Chan & Shark Ray Alley. You can’t leave the island without experiencing these two snorkel adventures. Hol Chan is located 4 miles southeast of San Pedro. It's like diving in your own aquarium. The ocean floor has a maximum depth of 30 feet, so both divers and snorkelers have the opportunity to swim in waters teeming with colorful tropical fish of all sizes and types along with beautiful coral formations. Divers can also enjoy the deeper waters outside the channel. 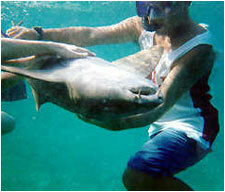 Shark Ray Alley is a must and it’s only a few minutes by boat from San Pedro. 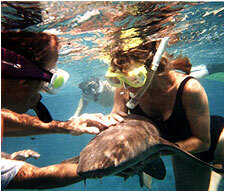 Hundreds of sting rays of all sizes congregate here accompanied by families of nurse sharks. With a depth of only 8 feet, the Sand Bar offers great photo opportunities. Mexico Rocks & Tres Locos is the second favorite spot of Lil’ Alphonse and his crew. It’s located on the North of Ambergris Caye island. You’ll snorkel the shallow waters of Mexico Rocks and Tres Locos. See a wide range of coral formations including flower, elk-horn and giant brain coral. This area is protected from ocean swells and currents, so it makes for easier snorkeling. Depth is only about 6 to 12 feet, so you can see everything up close. Water visibility is about 50 feet or more. Typically, we’ll go out in the morning at 9:00 am and or in the afternoon, at 2:00 pm. Again, we’ll pick you up at your hotel or other requested location. Night Snorkel and experience Hol Chan as it’s a totally new world at night. Huge stingrays sleep in the sand. Immense rainbow parrot fish are wedged in the most improbably-tiny coral caverns Octopus, sea snails, lobsters and moray eels can be seen foraging. Smaller creatures like glowing marginella, harlequin shrimp and hot pink file clams with their pure white tentacles can be found in their secret places. Lil’ Alphonse provide underwater lights to assist you in seeing the unbelievable sites. 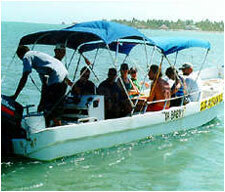 Charters on our boats for private tour of any snorkel location. We have a great deal of fun and experience with private groups. We can provide a photographer or video photographer as well if requested. On Da Boat, Lil’ Alphonse has snorkel equipment to fit anyone as well as Marine Park Tickets and flotation devices to assist those not as experienced. Upon early request his guides can provide RX mask as well. Lil’ Alphonse and his crew have been swimming, fishing and snorkeling the island waters since they were small children and have grown up with the importance of the taking care of the reef. Lil’ Alphonse Tours carry marine radio’s at all times for complete safety and valid tour guide’s license. Copyright © 2008 Captain Alphonse Graniel. All Rights Reserved.